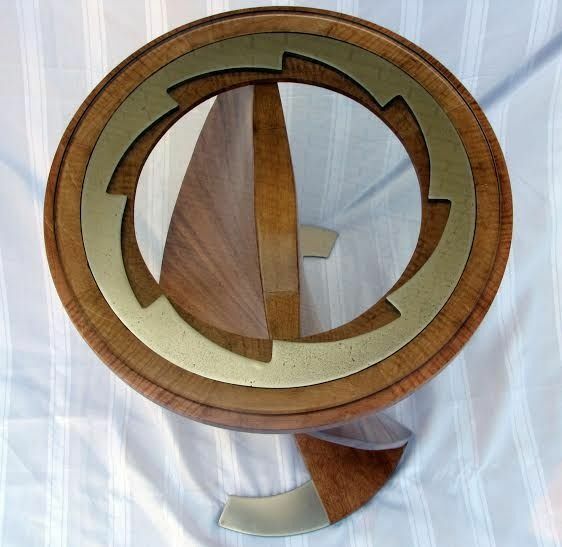 Simon Kenton Teacher Wins "Art at the X"
Xavier University’s annual Art at the X stars regional high school art teachers this year, with Simon Kenton High School’s Matthew Archer’s “Turbine Table” taking first prize winner. The exhibit continues through Sept. 26. Juror Matt Distel, The Carnegie’s gallery director, noted, “Matthew’s piece demonstrated great sensitivity to both design and craftsmanship,” both aspects of art-making Archer is deeply committed to. “I pride myself on creating furniture with simplicity in design coupled with excellence in craftsmanship," Archer said. “Turbine Table” is the first time Archer has created a work using all three materials and he’s pleased with the result. “I feel that the compilation of sweeping curves in this piece keep the viewers eye occupied in all areas. The table took approximately 100 hours of work -- steps included planning and designing, locating and preparing reclaimed lumber, constructing the form, sanding and smoothing, and spraying and polishing. While entries could include up to three pieces, Archer only entered Turbine Table. Archer says teaching visual art is “an incredible experience --I am given the opportunity to impact the live as of young people on a daily basis, fostering creativity within my students. Archer asks his students to create artworks that “are relative to the world around them. Taking current events and situations into account keeps students involved in the culture that surrounds them, gives them a voice. Archer is looking forward to “friendly competition“ within the art department his academic year as Simon Kenton enters student work into local competitions including Scholastic Arts and Writing competition and the Northern Kentucky Regional Art Show. Art at the X, through Sept. 26. Xavier University Gallery, A.B. Cohen Center, 1638 Herald Ave, Cincinnati. Gallery hours 10 a.m.-4 p.m. weekdays. The gallery will participate in SMITHSONIAN MUSEUM DAY LIVE! from 12-4 p.m. Sept. 26.